When his mother goes out to party one Saturday night and doesn’t come back, seven-year-old Ishmael Hood is taken in by his estranged uncle Henry and Henry’s live-in boyfriend, Sam. As this unlikely trio begins to build a new life together, they encounter both support and hostility in the small Mississippi town where they live. Seems like just about everybody has an opinion on the matter—and they’re not shy about expressing it. Just as a little shine begins to come back into their lives, Ishmael’s mother returns, and their world is thrown into chaos. What you’re guaranteed to get when you read Nick Wilgus books: a huge slice of southern life, heart-tugs that cause all the tears, and pretty much the most lovable kids in books today. 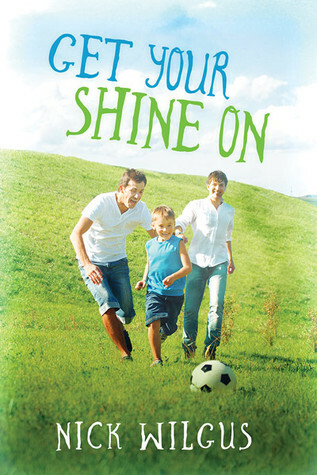 “Get Your Shine On” could actually just be an extension of Wilgus’ other series Sugar Tree. It is surprisingly similar…and that might have annoyed me in other cases, but I wasn’t entirely bothered by that. Because I liked so much about the Sugar Tree books. I love the southern charm, the southern hardship, the southern struggle. I love the kids in these books…both born with defects of some kind…but so very adorable and huggable. And I’m outraged by the “that’s not fair” circumstances facing these men in their lives. Another commonality between Wilgus’ works…they’re not quite romances. Yes, there men in love. But the true love story is between “father” (or father-figure and son). There’s an exisiting relationship that has had some trouble in the past which led to a fear to completely trust from one MC to the other. There’s family loss…and tragedy…and some really dark secrets revealed. There’s depression and a myriad of rough emotions. But above all else, there’s love…love between Henry and Sam, the couple. Love between Henry and Sam and the young boy, Ishmael. Love for an old dog. Love for a church. Love for a town. And the love isn’t easy…but I think that’s what makes it worth it. This entry was posted on July 27, 2015 by susan in Contemporary, Reviewer: Susan and tagged 3.5 Stars, dreamspinner, kids, nick wilgus.